Some people use way too many hashtags in their social media posts. Some brands use none at all. Many businesses are not sure how hashtags can help. Can hashtags help at all? For this study we wanted to look at how many brands use hashtags in their posts, how many hashtags they use per post and what the engagement rate is depending on number of hashtags used. All this in order to help you figure out what the best way to go is for your own brand. We looked at both Instagram and Twitter. We looked at three months of data from August 1st to October 31st 2015. The engagement rate shows the number of people who either click on like or comment (or retweet on Twitter) on the individual post as the percentage of the total followers. The results surprised us. Let’s take a look. We looked at more than 1,500 active Instagram accounts that posted 135,000+ posts in the 3-month period and had 300+ million followers combined. What did we find out? 13.8% of all posts didn’t include any hashtags. The engagement rate is highest (3.03%) in posts that use three hashtags. Second best and only slightly lower engagement rate, 3.02%, is on posts with no hashtags at all. 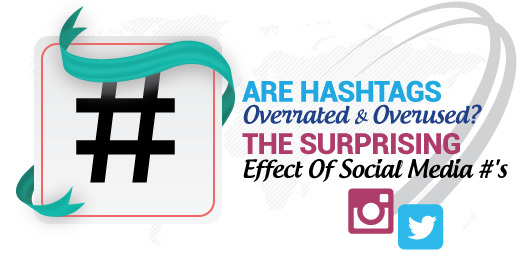 Many brands overuse hashtags on Instagram. 49% of all posts include four or more hashtags even though the engagement rate declines after hashtag number three. On Twitter we looked at more than 1,300 accounts that have 60+ million followers combined and that posted almost 600,000 tweets in the 3-month period. Twitter may have made hashtags mainstream but 55.8% of all tweets didn’t include hashtags at all. Twitter differs from Instagram by having the 140-character limit, which contributes to only 4.75% of all tweets having three or more hashtags. Surprisingly, adding a hashtag doesn’t result in any boost to the engagement rate. Tweets without hashtags outperform tweets with hashtags. How many hashtags should I include in my post? As you can see in these numbers hashtags may not necessarily be the answer to getting more reach and engagement. ● Discovery on both Twitter and Instagram may be broken first of all. ● Too much content being posted at any time might be one other reasons. ● Too much spam and irrelevant content being tagged might be another reason. ● People not using either of the platforms to venture outside of their own feeds could be the cause too. ● Brands using irrelevant hashtags in their posts is a possibility too. But what should a brand do? Following are our recommendations. So what’s the recommendation for Instagram? Focus on the quality of content itself. Your content needs to be interesting. It needs to be remarkable. It needs to be funny. Entertaining. Inspirational. Motivational. Informational. Even educational. Find ideas that work. Take a look at your past performance to see what type of imagery and videos worked best. Analyse your competitors through a tool such as Locowise in order to figure out what performs for them and get inspiration from their work. Twitter may be famous for hashtags but they do not seem to contribute much to your engagement. Do not spend too much time thinking about the perfect hashtag to use in your tweet. Recommendation to focus on the quality of content counts for Twitter too. If there’s a hashtag that is relevant and that stands out, do feel free to use it once in a while. Do not use more than one hashtag per post too frequently though as the engagement rate drops dramatically. Just like on Instagram, always think about what hashtags fit your brand. You should not include any irrelevant hashtag into your posts. That is spammy behaviour that will be very negative to your brand and will result in a lower engagement. Interesting in exploring hashtags a bit further? You can also Locowise to explore different hashtags. Our Hashtag tool allows you to see how many people use a hashtag, the reach of a hashtag and the trending use of a hashtag over a period of time. Get a free trial now.